I have the perfect simple side dish for you that is not only healthy but delicious. The flavors in this will make your taste buds very very happy. This is one side dish that you will want plenty of leftovers to eat on throughout the week. Since making it for dinner, I have eaten it on top of a spinach salad and I snuck a few of the apples to put in a bowl of Greek yogurt. I know I have all things baby on my mind these days but as we were eating this I mentioned to Jason how kid friendly it is. This is a wonderful dish for a child who is starting to eat solids because the squash and apples are very soft and can be easily cut down or even mashed. Plus they are getting in a serving of both fruits and vegetables. Looks like a win win to me. 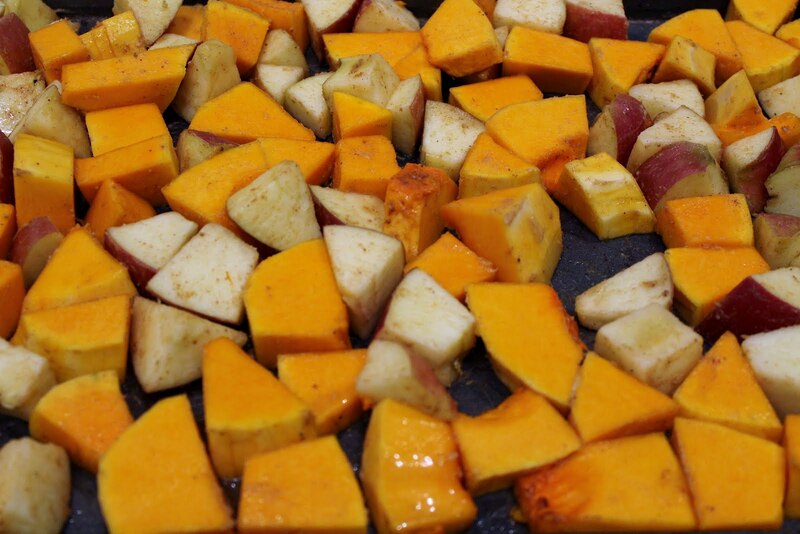 – Put the diced butternut squash and apples on a large baking sheet. – In a small bowl mix together the melted butter, cinnamon, and nutmeg. Pour over the squash and apples and coat well. Add the syrup and continue to mix until the squash and apples have been covered completely. – Loosely cover the baking sheet with tin foil and bake in a 350 degree oven for 1 hour.